contaminated milk continues to be sold in Maharashtra despite crack-down measures taken by authorities. The Maharashtra Food and Drug Administration (fda), had, in a study, found that 20 per cent of the milk is adulterated. Though the study prompted immediate action and licences of 21 dairies to be suspended, yet, there is no respite. In another study, the ngo Consumer Guidance Society of India (csgi) Mumbai, found that over 37 per cent samples were either sub-standard or unfit for human consumption. "India produces a little over 105 million tonnes (mt) of milk annually and out of this Mumbai consumes 1.65 mt. Of that, 0.61 million tonnes is substandard/adulterated," says Arvind Shenoy of cgsi. 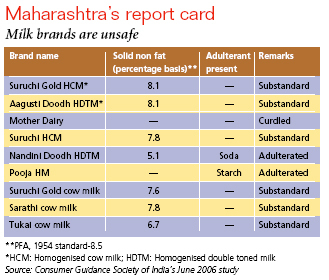 The ngo picked up 27 samples from suburbs of Mumbai and Navi Mumbai, of which 10 failed standards prescribed under the Prevention of Food Adulteration Act, 1954 (see table Maharashtra's report card). Gang action Maharashtra's adulterated milk problem is an old one. Both the fda and the state government acknowledge it is a well-established racket. "There are gangs, which cut milk pouches and add adulterants and reseal the pack; or use a syringe to take out milk and replace it with adulterated milk," says D N Khamatkar, fda commissioner. The fda study, which has found urea (affects urinary system), starch and caustic soda (damages digestive tract) in the milk, says it is trying to curb adulteration. "Of the 866 samples collected, 151 were found adulterated. We have initiated action against some dairies," says P R Uttarwar, joint secretary (food), fda, Mumbai. And these samples, says Amitabh Chandra, former fda commissioner, did not account for adulteration that takes place during milk transportation and distribution. ngos, however, allege that officials accept regular bribes from gangs. They demand immediate action. The problem is not restricted to just within the state. In 1999, Ahmedabad-based Consumer Education and Research Centre tested 28 brands of packed milk and two samples of loose milk from Ambawadi and Ambica, local dairies. All the 30 brands failed in microbiological parameters specified by the Bureau of Indian Standards. Most brands had coliform and EColi. Twenty one samples failed fat content standards and four failed solid non-fat parameters. Perservatives were found in 12 samples and pesticide residues in 27. Heavy metals such as copper, lead, zinc, arsenic, cadmium and mercury were also found. Milk from Gujarat comes into Maharashtra. In wraps While fda officials are not ready to reveal the areas where milk adulteration takes place, Shenoy claims that it happens in the open in areas like Antop Hill, Saki Naka, Kurla and Dharavi in Mumbai. In September 2005, deputy chief minister R R Patil along with the Mumbai police crime branch had seized 10,000 litres of adulterated milk from slums in Kapaswadi (Andheri), Khar Danda, Vatsala Naik Nagar (Kurla) and Babhai Naka (Borivali) and arrested 39 people, who were charged with adulteration and forgery. But the recent studies by fda and cgsi show little has changed. Infrastructure and sloth Testing for contamination is another issue. fda does not have a dedicated food testing laboratory of its own.It has asked the state government to set up six such laboratories in six divisional headquarters. fda now has to depend on the state public health department laboratory in Mumbai and Pune, and mcgm's laboratory at Dadar, where testing sometimes takes more than the stipulated 40 days. About two years ago, the state legislature had come with a proposal to make milk adulteration a non-bailable offence but it is still in the draft stage. When Down To Earth contacted the dairy development department of the Maharashtra government, its general manager, V A Gaikwad, passed on the buck to fda claiming milk adulteration has nothing to do with his department. And hence, adulteration continues. If any one want to increasing SNF ratio without adding Powder. We have a technology which remove water from Milk and it's also possible to control SNF as per our requirement.